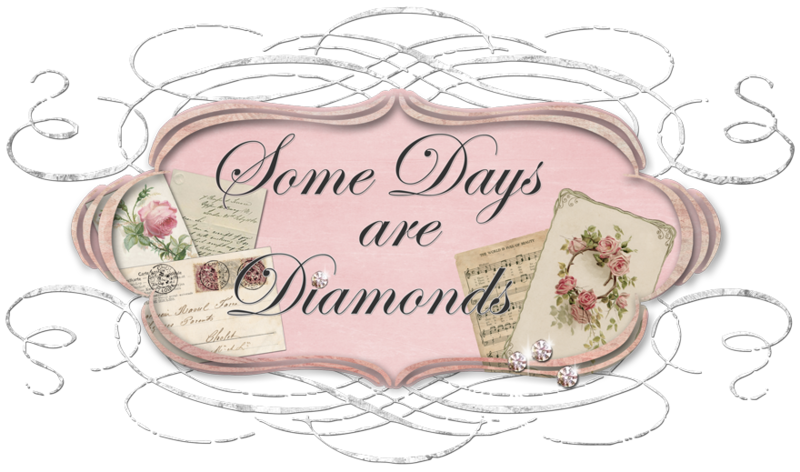 Some Days Are Diamonds: Happy day and something very special! a little bit of our Christmas! some presents under there for us. And Brandon helped me open mine! new plastics for his dirt bike. Mark got Karen them both. They were hidden behind the coach. Karen's is pink for crying out loud! She was so excited she jumped right on! a chopper! A manly man bike! The boys had to get in on the fun! how excited they were over these bikes! around the RV parks they stay in. They had way too much fun without us. a Christmas as we all did! Harley has been entertaining you I see! You might all remember Patty - she was my swap partner for a Tussie Mussie swap back in May. beautiful wings and diving headfirst into blogging. And much more - so read on! the N2 God Store is opening January 1st. even if you're not in Kansas anymore (ha ha). "very interesting from the get go". (just leave a comment on one of her posts). ‘We make a living by what we earn. We make a life by what we share’. Patty extends heartfelt thanks to all of you! Have a wonderful day and if I don't see you before then - have a wonderful and safe New Year! OMG, great post! Your family is precious and I just love them all! Those bikes are TOO cute and of course YOURs is PINK... so is mine:) Love that sweet Taylor, just can't get enough of her! Love you bunches my friend! Have a blessed day, I AM CLEANING for my weekend company! I have decided, "I HAVE TOO MUCH STUFF"! BIG HUGS FROM "Your Georgia Sister"! NOW HARLEY, I sure loved your post!! !Mommy did good, huh!!!! I love that pink purse and I have wanted a Pink cruiser bike for a long time!!! !I have my old 5 speed bike with a nice soft cushy seat, but it is green!! !I love green, but PINK makes me smile!!!! Oh such fun and that baby girl is so sweet and so much fun!!! I will see you in a Few weeks!! Thank for sharing your family get-together! You're blessed! So much fun!!! I love the pink bike!! Oh now everyone in bloggyland will want a pink bike! And that Coach purse!!! You were one good girl for Santa this year! I love seeing you all out riding your bikes. It seems so weird to me since we are so covered in snow. Cute little baby niece too, bet you all love her! I have an announcement too! Come by and see when you can! I love the pictures! I simply love your new bike too. It looks like you had a good Christmas according to harley! What an adorable dog! I hope the new year is good for you too! how adorable are you on that pink bike!!!!! I love it! glad you had a wonderful Christmas! Harley, You dogs and your family seemed to have had a wonderful Christmas and lots of fun! Tell Karen I love her new pink bike! I always tell hubby that I would like to have a pink car with cream colored lace motifs :-). Looks like a wonderful Christmas, Karen! LOVE your new bike! I've been wishing for a pink one just like that--lucky!!! Wishing you and your sweet family a most wonderful, happy & healthy New Year, my friend! This look like a PERFECT Christmas to me! And those bikes are AWESOME!! Looks like you had a wonderful Christmas Karen! I LOVE your cute pink bike! Wheeee! I love the bike! And the weather! I don't think we'll be on bikes anytime soon around here. A pink bike...I'm so jealous:) Your family looks wonderful. So glad you had such quality time with them. Hope you and yours have a very blessed 2011! Thanks Harley and Jorja for the update and tell your mommy that I love her bike. It was fun seeing your boys and that baby girl is so precious!! Happy New Year! I do remember our fun New Years and the one we remember most with all the confetti the boys threw all over your house!! We sure had fun! Good times! What a great Christmas! I love your bikes, way too cute! Your family photographs are just beautiful! i wish you all the best in new year. Happy new year 2011! Hi Karen, wonderful pictures....just so sweet. Happy New Year and many, many blessings to you and all your dear family. Thanks to Harley for a great post. Love the gifts you got, especially the pink bike. Your fur babies are some of the best bloggers ever! So glad you had a wonderful Christmas! I love you new bike...it's so you! wow girl, those bikes look like so much fun. Happy New Year.